At the edge of the solar system, astronomers have unexpectedly sighted an object slightly smaller and farther from the Sun than Pluto  not quite another planet, but not a temporary visitor either. Announcing the discovery yesterday, a team of scientists led by Michael Brown of Caltech in Pasadena, Calif., said the object is a planetoid  an asteroid that resembles a planetary body. 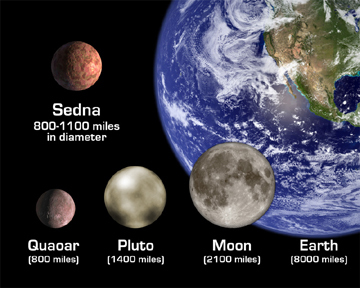 Artist's rendering compares the three smallest and most distant planetoids in the solar system  Quaoar, the newly sighted Sedna and Pluto  with Earth and the Moon. Image courtesy of Caltech/NASA. Brown's team has hypothesized that the small red planetoid may be the first object ever sighted from the Oort Cloud. The large assemblage of comets sits much farther outside the solar system than the planetoid's orbit. Other scientists noted the object could be a captured part of the Kuiper Belt, a disk of icy comets near Neptune's orbit. For more information, follow the links below.